Attending church every Sunday is very important to me. Some may argue that church is in your heart and you can worship a number of ways, and I agree to some extent, but for me church is important. It is not because I learn there, even though I do. I can (and do) learn many different places. It is not because I feel the spirit there, even though I do. I can feel that in a number of places and ways. It is because, as a Christian, I believe a life was given for me. I believe the greatest sacrifice was made on my behalf. I can sacrifice three hours of my week to honor that. To demonstrate to my Heavenly Father and the world that it means something to me. We bring our daughter to church every Sunday. She is little and needs a lot of attention, which often leaves little attention left for me to give the speaker/lesson/hymn/etc. But we go, each and every week. I go for me, but I also go for my daughter. Taking my kids to church, every week, is something that is very important to me. JaiseAnn is already learning. She may not be digesting doctrine or the verses of scripture or hymn being discussed, but she is learning. Language skills are already being developed. I am happy to have her in a place where she is already being exposed to the language of prayer, scripture, hymns, and testimony. There is certain way to behave at church, although this concept is clearly lost on some families. JaiseAnn is too young to learn how to sit still (or somewhat still) and quiet, but she will eventually. 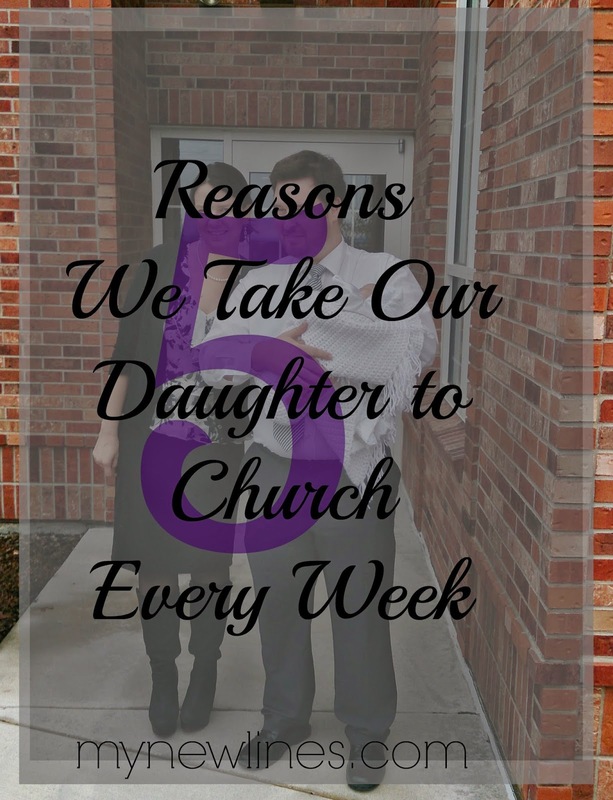 Taking her to church every week as she grows older will help her to practice behaving and will help Zach and I continue to teach her appropriate behavior. These behavioral skills will hopefully (and most likely) transfer to most public settings. Again, she is too young to be learning many skills outside of her developmental stages, but eventually she will start to learn skills like using a picture to remind her of words in singing time, finding a page in a book, or memorizing a word or phrase of importance. As she gets older, church will be part of the expectation. It won't be a surprise we spring on her and expect her to happily go along with. It will be part of the norm and I will be grateful to have so many different examples surrounding her. She will have examples of good men, women, and kids her age. While I attribute most of my character to the way my mom raised me, I know that she will forever be grateful to the people who taught me in church. I watched those families and I decided that was what I wanted for myself. When I would babysit for families in the ward, I kept a diary of things they did that I wanted to do with my own family some day. I want to make church a regular part of our lives and by doing that, JaiseAnn will be surrounded by others regularly that she can look up to. I want very much for my daughter to know where she comes from and why she is here. I want her to understand her worth and God's love. I want her to obey commandments. Oh how I want her to have high moral standards and follow those commandments! In order for her to be strong and know who she is at all times, to know what she's worth, I feel she needs to have a deep rooted belief that she is a child of God. I can teach her this at home, but she needs to learn aboutHim from others as well. She needs to spend time hearing others bear testimony of this truth. Church is not the only place a testimony is built, certainly, but it is one place and that alone is worth it to me. What about you? Do/Will you take your children to church, even when they are babies? Why or why not?